Google Now already tells you when it's time to head to the airport and even helps you book a new flight if the one you're supposed to take gets delayed or cancelled. A new update lets you know when airplane tickets you might be interested in are available at a discount. Like everything else with Google Now, this feature works seamlessly based on other information it scans from your smartphone. There's one drawback, though. According to Android Police, the new info cards will only show up for flights you looked at through the company's own Google Flight service. That means it can't help you get a deal if you shop for plane tickets through a third-party site like Kayak.com. Hopefully we'll see the new feature expand to cover other travel planning services soon, at least on Android where Google Now is really baked into the operating system. 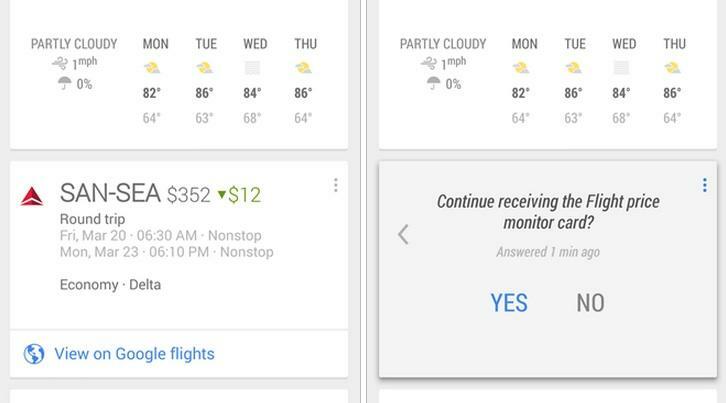 You should start seeing the new Google Now card pop up soon, at least if you use Google Flight for trying to find the lowest cost airline tickets.